What Is a Forecaddie in Golf and What Are the Duties? What Is a Forecaddie in Golf? A forecaddie, most simply, is a person positioned up ahead on a golf hole whose job is to track golfers' shots as each plays his or her golf ball. Contrary to what you might think, the forecaddie is not a caddie. The forecaddie does not carry anyone's clubs, does not assist golfers in decision-making on things such as club selection, and so on. And while forecaddies can be assigned to work with a specific group of golfers throughout a round, they are often assigned to a specific hole on a golf course rather than to specific golfers. Most recreational golfers will never encounter forecaddies during their play, unless they take part in tournaments. "A forecaddie is one who is employed by the Committee to indicate to players the position of balls during play. He is an outside agency." Because a forecaddie is defined as an outside agency in the rules, if a golf ball at rest is moved by a forecaddie there is no penalty to the golfer and the ball should be replaced (Rule 18-1). If a forecaddie deflects or stops a ball in motion, it is a rub of the green and the ball is played as it lies - except when the ball comes to rest on the outside agency; or when the stroke was played on the putting green. See Rule 19-1 for the full text and explanation, plus the course of action for these exceptions. Is It Forecaddie or Forecaddy? Forecaddie, with the "ie" on the end, is the correct spelling. It's the spelling used by the governing bodies of golf, the USGA and R&A, and used in the rules. However, "caddy" and "forecaddy," ending in "y," are frequently used by fans and non-golfers, and those spellings are even creeping into golf publications. So although we (and the governing bodies) consider caddy-with-a-y to be an incorrect spelling, both spellings are commonly used, and considered appropriate. The forecaddie's job is to keep golfers moving on the course by keeping track of all golf balls in play and letting each player in the group know where his or her ball is located. For example, one player in the group hits his ball into high rough. The forecaddie searches for the ball, and points it out to the player so that play continues without delay. On television broadcasts of professional tournaments you have probably seen individuals outside the fairway run over to a ball hit into rough and stick a little flag into the ground near the ball. That is a forecaddie. 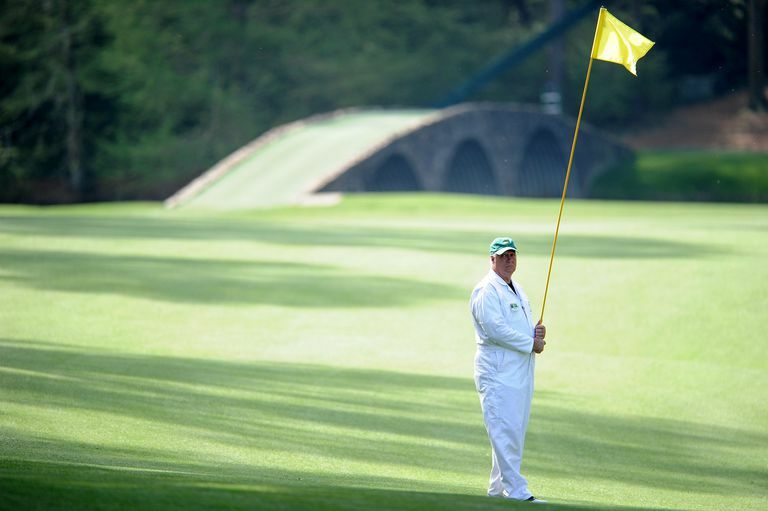 A forecaddie in a tournament setting might carry a larger flag or a paddle or other indicator of some kind that he waves to the golfers on the tee to indicate if a ball is in the fairway, in the rough, or is perhaps lost or out of bounds. You've probably seen forecaddies doing that during golf TV broadcasts, too. So, as you can see, golfers who play in organized tournaments are far more likely to encounter a forecaddie that those who don't. Golfers who only play recreationally rarely encounter forecaddies. (Although a passing course marshal might temporarily act as one.) Some upscale and resort golf courses do offer the option of a forecaddie that a group of golfers can hire. "The Committee may position forecaddies in areas where there is a possibility of balls being lost, or course marshals/ball spotters may be asked to fulfill this role. Such a policy can assist with pace of play if balls can be found quickly or if players can be made aware that a ball has not been found and, therefore, are encouraged to play a provisional ball. So that all players play under the same conditions, the Committee should ensure that a forecaddie or ball spotter is present all day." The R&A further states that, "if the use of forecaddies is to be successful, there must be a clear and efficient signalling policy so that the status of the ball is clear to the player concerned. It is even more vital that the system is unambiguous when the forecaddie is signalling with reference to whether a ball is in or out of bounds." On Your Marker: Just Who Is That In Golf, and What Are Marker's Duties? Just What the Heck is 'the Committee' in Golf? Your Aim Is True: Is It OK to Draw An Alignment Line on the Golf Ball?